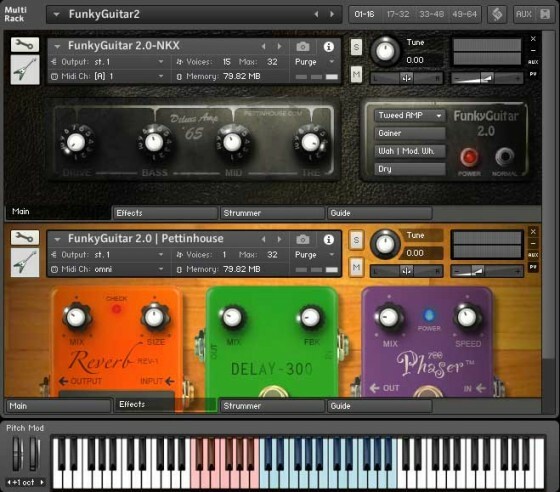 FunkyGuitar 2.0 is an innovative Stratocaster guitar sample library for Native Instruments Kontakt 5 FULL retail version made for playing Funky Guitar Riffs. 1,15Gb of library with automatic strummer with patterns and 15 Funky Guitar Chords, chord variations, Sliding chords, Strum noises, Free chords and Muted notes. It has a built-in Amp simulator, Wah, Distortion, EQ, Reverb, Delay and Phaser. You can also play it DRY with your favorite amp simulator.